Why Is George Barris Getting Credit For The Monkeemobile? 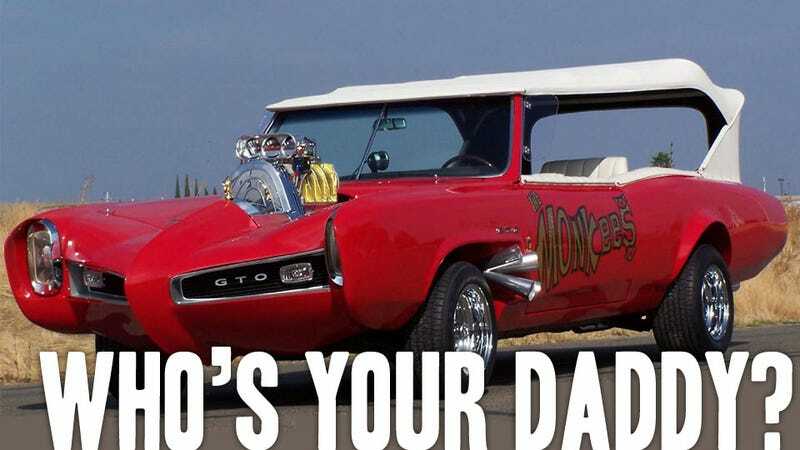 With yesterday's unexpected death of the Monkees' onetime-hearthrob Davy Jones, there has naturally been a resurgence of interest in the amazing, funhouse-mirror version of the Pontiac GTO that was the Monkeemobile. Shows like TMZ have been interviewing famed customizer George Barris, asking him questions about the unusual 7-seater's whereabouts, build, and more. There's only one problem: George Barris didn't build the Monkeemobile. Dean Jeffries built the Monkeemobile, back in 1966. Jeffries was given two Pontiac GTO convertibles to use for the project, as Pontiac felt an association with the Monkees TV show would be great publicity. Two cars were built, one for the show, one for promotions. Some interesting details about the cars: they had a solid, unsprung rear axle to assist in wheelie-popping, and were so over-powered they were difficult to drive, which led to their superchargers being replaced by dummy ones. After the show ended, Jeffries declined to purchase the cars back for a grand each (he figured he could rebuild them cheaper). The TV show car was left in Australia after a tour, and somehow ended up as a courtesy car at a Puerto Rican hotel, reappearing at auction in 1992. Nobody knows how it got halfway around the world to end up in Puerto Rico; I'm sure there's a good story there. George Barris did purchase and restore the second Monkeemobile, and showed it at many events, eventually selling it in 2008 for $360,000 to a private collector. Barris' company has also built replicas of the Monkeemobile, but that is the extent of Barris' involvement with the car. I have a huge amount of respect and admiration for Barris, but to publicly take credit for a car he didn't create just isn't right. Barris is 87, and perhaps he's not specifically saying he built the car, and the journalists have gotten in wrong. Maybe, but so far I haven't seen him quoted mentioning that the car was Jeffries, and many of the current batch of Monkeemobile-related stories are crediting Barris with the design and development of the car. It does seem that Barris has been taking credit for the Monkeemobile for a while now, with sources saying that in addition to small-scale irritants like autographing posters of the car, he pressured toy and modelmakers who made versions of the Monkeymobile into replacing Jeffries' name with his own on packaging and documentation. Motor Trend Classic: There seems to be some confusion. Was it you or George Barris who designed and built the TV car for the Monkees, the Monkeemobile? Jeffries: That's one of many bad spots in regards to that man. He sure does take credit, but he had nothing to do with it. I made the car. Every bit of it. He also says he made the Green Hornet's car, still does to this day. He puts his name on a lot of things he had nothing at all to do with. Perhaps the whole story isn't known, but an unarguable point is that Jeffries is not getting the credit he deserves for an iconic custom car, and that's not right.